1. The link to your wedding gallery will take you to a welcome screen. 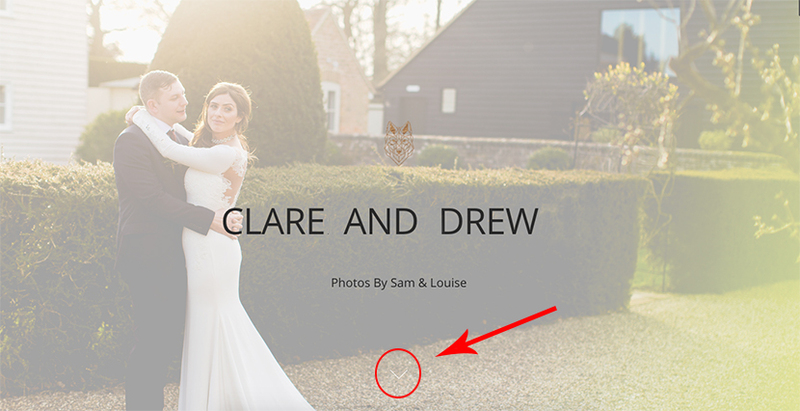 To access your images, simply click the bouncing white arrow at the bottom of your screen. It should be in the centre of the page. 2. Once you’ve entered your gallery you’ll see a row of categories along the top of the screen. Because there are so many photos, we have split your day into categories to make it a little easier for you to navigate them all. You can either jump from category to category, or just continue scrolling through the whole set. 3. You can enlarge images by clicking on the photo you’d like to see. It’s not blurry- it may just take a few seconds to load depending on the speed of your internet connection. 4. 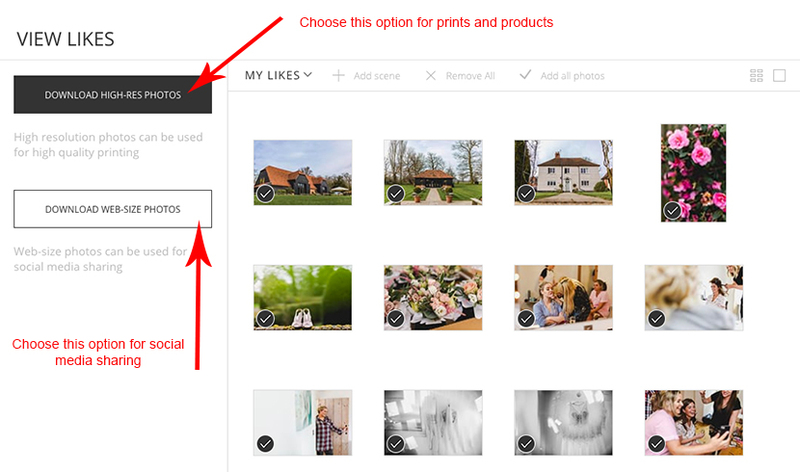 If you would like to “favourite” any photos, click the little heart icon displayed on each photo. These photos will be saved to your favourites, in the top right of the screen. 5. You can download images as a full set, as a batch, or as single images. To download the full set of photos click on the download arrow shown in the top right of the screen. You’ll be asked to choose whether you want to download high res files or web size files. If you plan to upload images to social media such as facebook or instagram, we recommend selecting web size files as this will be smaller files optimised for quick uploads. If you are downloading so you can order prints or other products, or so you back up your photos to a USB/hard drive we recommend choosing the high res files option. 6. To download single images, or a selection of images, click the download icon on whichever photo(s) you’d like to download. Any images you’d like to download will be added to your download queue. When you are ready to download photos, click on the download arrow in the top right of the screen. You will be shown your image selection and asked to choose whether you want to download high res files or web size files. If you plan to upload images to social media such as facebook or instagram, we recommend selecting web size files as this will be smaller files optimised for quick uploads. If you are downloading so you can order prints or other products, or so you back up your photos to a USB/hard drive we recommend choosing the high res files option. 6. You can also download all of your favourites as one batch too. When you’re done selecting your favourites simply click the heart icon in the top right and follow the steps above. 1. Included with your images is a printing licence with enables you to print, copy and share your photographs on an unlimited basis, for personal use. This print licence extends to your guests, family and friends too. This means you are welcome to obtain your own prints or albums from consumer labs if you’d like. However, we cannot accept liability for (or help) with any print quality issues as a result of using high-street labs for prints or products. 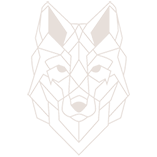 We are only able to guarantee the print quality of images and products ordered through us and our professional processing labs. 3. If you are approached by any of your other suppliers for copies of your images and you are happy for them to be shared, please refer the supplier to us ([email protected]) Not only does this help us to forge business relationships with other suppliers, but it also allows us to help ensure that your privacy is maintained. Unfortunately we are asked to step in and pick up the pieces several times a year due to other suppliers misusing photos provided to them in good faith by couples. There have been several instances recently of over excited suppliers posting full wedding gallery links publicly to show off their work, for example. Other suppliers have used photos in newspaper adverts or magazines without a couples permission. It is much easier all round if we can help set expectations before there are any issues. We know it sounds like a formality, but please appreciate that the photographs we deliver to you are our product as we are in a service based industry. Florists do not give us their flowers for free and (sadly) cake makers do not give us free cake, so we kindly request that you allow us the opportunity to network and protect our brand and your memories by referring any suppliers to us. Do you have a moment to spare? Would you consider leaving a review for us on google and/or Facebook? In this digital age most of us wont even consider placing a booking or order online without first reading reviews. Unfortunately only around 10% of people go on to actually leave a review themselves. 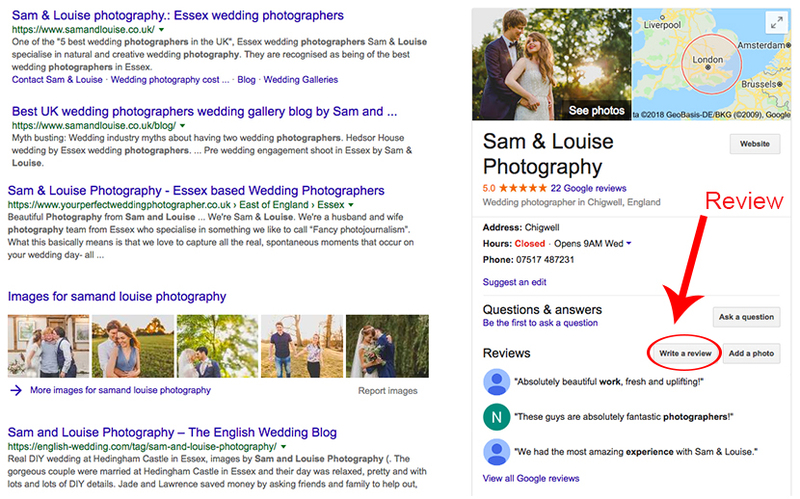 We have photographed over 200 weddings but only have around 20 google reviews. We hate to have to ask as we know how busy life can be, but google reviews really are the best “Thank you” we could ever receive. They help us stay visible in search results, which is how most couples find us. Please take a moment to help us stay visible to other couples seeking a wedding photographer in Essex. Reviews are welcome from anyone involved in the wedding- brides, grooms, suppliers or family and friends. They are always hugely appreciated.